Red velvet cupcakes using this recipe from The Food Network. The recipe filled 12 Texas-size muffin tins and took about 28 minutes to cook. Texas size is very big, I’m starting to think they are too big! The base is 2 and a 1/2 inches wide, the top is 3 and a 1/2 inches across. Holy Moly! They are massive. Are they good? I’ve not yet tried a Red Velvet cupcake for fear of red coloured teeth from all the colouring. 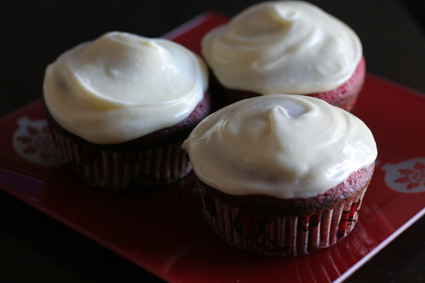 I love this recipe and the cupcakes proved to be very popular! I think the size was just a little too big, everyone is watching their health these days. The taste is delicious, and quite different to most cakes I’ve eaten here in Australia. It’s really best to make a whole cake (two layers) and cover the whole thing in frosting – so everyone gets a surprise when you cut the cake! I’ve found people to be very curious about the red colour and the texture. I haven’t had any problem with the red colouring staining teeth or mouths at all. I guess you could try a colour gel, since you would need a smaller amount. My taste testers described the cakes as “velety”!